The varsity St. Andrew’s Saints are picking up right where they left off on the ice. The division-one squad bowled through the competition in the first weekend of CISAA action, going a perfect 3 – 0 against their league rivals. Opening the independent league season Wednesday against Upper Canada College, the two finalists of last year’s CISAA Championship never saw eye-to-eye in a 5 – 1 drubbing by St. Andrew’s, who threw over forty shots at the UCC net. Christian MacDougall led the way with a pair of goals. 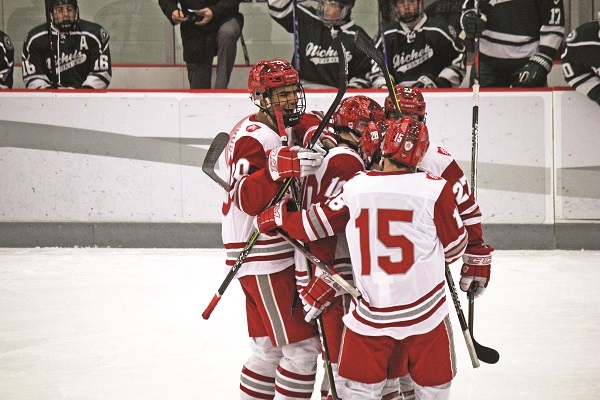 Friday had the Saints back home at Labrier Arena to face off against Nichols School, where the Saints once again took it to their opponents early in a 6 – 0 win. Merrimack College commit Mark Hillier posted a three-point effort, while Brendan Bowie, Campbell Clarke, and Matthew Steinburg also found the back of the net. Wrapping up the weekend against Ridley College on Saturday, an early lead was once again the factor in a 4 – 2 win with Bowie and Devlin O’Brien getting on the board in the first period. Jack Agnew scored in the second, while Clarke potted his second goal of the year early in the final frame. The trio of wins brings the Saints’ full record including exhibitions this season to nine wins and zero losses, never conceding more than three goals in a single game. It’s a hot start for the winners of the last six CISAA trophies. A trip to Boston to face off against the prestigious Belmont Hill School kicks off this weekend to begin a long road trip, before the Saints return to LaBrier Arena on Dec. 8 to host Shattuck St. Mary’s of Minnesota, the alma mater of NHLers Sidney Crosby and Nathan MacKinnon.